Additional research provided by Natalie Popovic. Gristmills used to grind corn, wheat, and other grains into flour and meal were a common sight in eighteenth- and nineteenth-century North Carolina. The first recorded North American gristmill was built in Jamestown, Va., in 1621. As settlers moved from the Jamestown area into what is now northeastern North Carolina, they carried their milling techniques with them and began building small mills to grind grain. Gristmills generally operated by guiding a stream of water into a waterwheel, which provided the power to rotate the series of huge millstones that crushed the grain into progressively smaller pieces. Most early North Carolina gristmills were situated along creeks for a source of waterpower, usually near natural falls. Many gristmills had saws attached, harnessing the waterpower not only to grind flour but also to saw lumber. Power was increased by building dams. On some mills, millraces were built to carry water to the mill, particularly those equipped with an overshot type of wheel. The demand for grinding grain for use as flour or meal grew as the population of North Carolina increased. In an effort to encourage the settlement of the Carolina backcountry frontier, the legislature in 1715 passed a law granting 50 acres of land and exemption from taxes and service in the state militia to gristmill and sawmill operators. This act contained a provision subjecting all mills to government regulation because of their "public" character. Despite these efforts, the number of mills in the colony remained small until the mid-eighteenth century. A more extensive and detailed law was passed in 1758, giving the colonial government greater supervision over the operation of mills. Roller mills, an 1876 invention first used in John Sellers's mill in Philadelphia, had a tremendous impact on the milling industry. The roller mill had several advantages over stone mills. Primary among them was a product that was more uniform and had a more appealing appearance to customers. The use of rollers eliminated the need for stone "dressing," the periodic sharpening of millstones, saving the miller money and time. The rollers also extracted more flour from the same amount of wheat as the millstones. Most North Carolina mills built after 1876 were of this variety. Few of North Carolina's older gristmills remained operational at the beginning of the twenty-first century, having become obsolete in the shadow of the larger, more efficient grain processors of the Midwest. House's Mill near Newton Grove in Sampson County claims to be the oldest continuously operating gristmill in the state, having ground flour and meal since 1812. Grimsley Hobbs, Exploring the Old Mills of North Carolina (1985). Catawba County Historical Association. "Historic Murray's Mill." http://www.catawbahistory.org/historic_murrays_mill.php (accessed June 14, 2012). The Society for the Preservation of Old Mills. "The Old Mill of Guilford." http://www.oldmillofguilford.com/ (accessed June 14, 2012). Dunaway, Stewart E. Grist mills of North Carolina: a historical review using county records [North Carolina? ]: S.E. Dunaway ;Morrisville, N.C.: Distributed by Lulu.com. 2010. Stephen Cabarrus History Club, Harrisburg School. By the Old Mill Stream: The Story of Early Industry in Cabarrus County. [Harrisburg, N.C.: Stephen Cabarrus History Club, 1967?]. 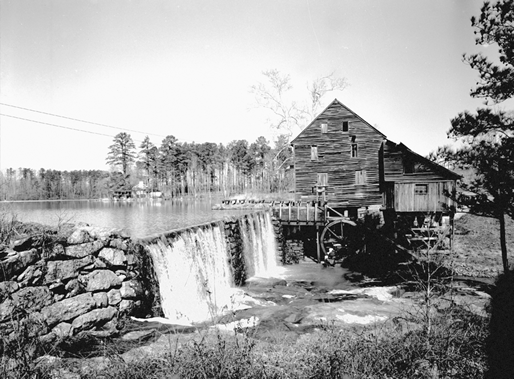 Yates Mill, a gristmill in Wake County, 1958. Courtesy of North Carolina Office of Archives and History, Raleigh. Hello, I'm looking for information on the grist mill belonging to John W. Wells (b.1815-d.1891) which was on Willow Creek. He built a house near there for his wife, Rachel Penland, which I don't know if it's still standing. Any information is appreciated. Thank you for visiting NCpedia and especially for taking the time to share your question. I am going to forward your question to reference librarians at the State Library of NC. A librarian will contact you shortly to help with this question. Kelly Agan, NC Government & Heritage Library, State Library of NC. I am looking for information regarding a grist mill in eastern NC in the vicinity of Wilson / Pikeville / Goldsboro. My great grandfather, Cyrus Cox,is said to have operated this mill, known locally as Cox's Mill. My father helped his grandfather at times. Any information and / or pictures would be greatly appreciated. Thank you. Hi, I reside in Bladen Co and my property (which passed to me from my father) is located just off Hwy 210 along the run of Cypress Creek just before it meets South River. We have a great deal of evidence of a saw or gristmill having been located on the property but cannot find any real record or info on it. If my father did during his life he never mentioned it but we have always been very interested in our community's history. The pieces of the mill that we found seems to suggest it was burned or sustained fire damage of some sort. Could anyone help me in researching this? Thank you for visiting NCpedia and especially for taking time to share your research question. NCpedia is the online encyclopedia of North Carolina, and unfortunately we don’t have any resources that would help you with Kansas history. We do get a lot of questions about historic grist mills in North Carolina as well! In addition to doing some further web searching, I have a couple of suggestions. First, you may want to contact the local or county public library for the Cato area. Local public libraries are often a first stop for local history and the librarians there may have information and resources to help you. I also did a quick search of WorldCat (an online catalog that searches the holdings of libraries around the world) and pulled up a few resources that might be interesting. Here are the search results: https://www.worldcat.org/search?qt=worldcat_org_all&q=kansas+grist+mills. If you click on a particular resource, you can see a list of libraries that have it. Your local library may be able to get a book for you through interlibrary loan. My other suggestion is to contact the Kansas State Historical Society -- https://www.kshs.org/. They would be an excellent resource and will very likely know of available histories and resources on grist mills in the state. I am looking for information about Fischer or Fisher Mill around Salisbury area during early settlements pre post revolutionary era. My great-grandmother (Nancy Garner Ellenburg) ran a gristmill near Highlands, NC in Macon County in the 1930s and 1940s. Would you please tell me where I might find a listing of mill sites in that area from this time period? Thank you. Thank you for visiting NCpedia and especially for taking time to share your family history and research question. I am connecting you by email with Reference Services at the NC Government & Heritage Library. A reference librarian will contact you shortly to help with your question.